A dragon, a dancing water spirit, what will this photographic image become when it works its way into my artwork? Until I travelled in a small plane to the shores of Lake Eyre in 2011, I had no idea why the S. E. corner of Queensland bore the name the Channel Country. A vast, sparsely populated arid region nearly a quarter of the state, it is desert but for three major river systems, the Diamentina, the Georgina and the Coopers Creek. When it rains further north, the water follows the fall of the land into the centre of Australia towards Lake Eyre which, at its lowest point, is 15 metres below sea level. Rarely is there enough rain to push the water along to fill the dry salt lake, but when it does the desert comes to life. 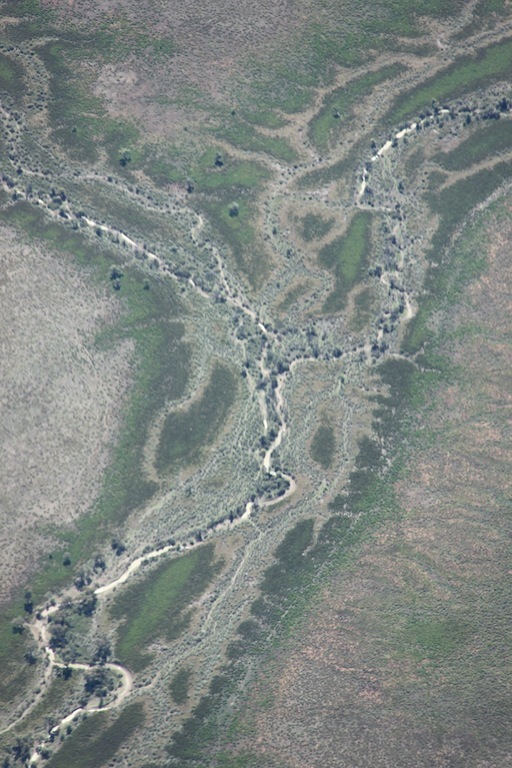 The cracked land and dry watercourses fill up, creating the channels that give this region its name. As they dry out again nature paints the most amazing images.